Pay attention to tiny annoying little files that don't exist. I'm not sure if this will help anyone or not. However, it's an interesting story so I thought I'd share. I've been working on project XYZ.com (named changed to protect the innocent) trying to stablize it for the owners because the morons who built it were ... well... morons. (You can only work a project so long before you come to these type conclusions. I am probably being a bit harsh.) In any event, there is a couple parts of the application that makes heavy use of the session to manage dynamic search results. (remember that I'm coming back to it.) This application current supports three out of the four major browsers (at least by my standards) IE, FF, and Safari and one browser (Chrome) had been turned off almost a year ago because it was "acting too flaky" and "not rendering images or pages properly" according to the owners. As I've come to find out, actually all of the browsers behave a little flaky now and then but not as bad a Chrome which in some features of the app just refused to work. So I decided that I should turn on Chrome to do some testing and I immediately got frustrated with the crapy results. In fact, I was about to give up totally and disable it again when a bit of blind luck happened. I was using the Visual Studio Debugger and I had Fiddler open (as I often do now) I actually noticed that Chrome was being freaky agressive about asking for the favicon.ico file. I mean like freaky, every 3 or four requests it would ask again (like if that file is not there the first time it's going to somehow magically appear seconds later, and who really cares anyway?) and on top of it it was doing that (as it should) in a separate request. The only problem was, the file does not exist on this site. It never has. So the MVC framework (I think) or who the hell knows what because I haven't dug any deeper yet, was doing a redirect to "Index" which Chrome followed the redirect (on the file which is technically only suppose to be in one location) which caused app to serve up the home page. This is where things started to get ugly. This caused caused the session data (did you remember? it used heavily in a couple key places) to be wiped totally clean. So when you try to create that user account or store your search results they vanish before your eyes! Bingo! Flaky results at random intervals! Moral of the story... You must pay attention to tiny annoying little files that don't exist. I love Fiddler... I love the debugger ... the end. Although not completely obvious, the clue to the failure is in the location of the failure. Failed in capistrano in transfer.rb and it's failing there because tar didn't execute and therefore didn't create the archive file to transfer to the server. I truly love that when capistrano runs it identifies each command it's going to execute so you can see what it's trying to do. I'm sure it would have been a much longer trouble shooting session if I had to dig through source to figure that out instead of it just telling me. When I received that error, knowing that it was working fine a few months ago, it was obvious to me that I had made some changes to my environment that introduced the problem. As it turns out, I was missing unix utilities in my PATH and in particular I was missing tar. Once I added a path to my Cygwin/bin folder to my PATH everything started working again. Hope this helps someone avoid a few minutes of trouble shooting. The upgrade can not be started. To upgrade, cancel the installation and then choose to upgrade to a version of Windows that is more recent than the version you are currently running." and the button I would use to perform the upgrade in place was disabled. Naturally I was a bit confused since my current installation was Windows 2008 Standard Edition SP2 and I'm trying to upgrade from Enterprise Edition 2008 SP2. After a bit more digging on Google I found this blog post (Thanks Network Steve) that suggested that maybe SP2 was the issue causing the button to be disabled. So, not feeling very good about this approach, but with no other real options, I decided to go for it. After making all the necessary backups I uninstalled the service pack. Yes, the OS still booted and seemed to work and fortunately for me this actually solved the issue with the installer. I was able to do the upgrade in place from Standard to Enterprise Edition. I keep getting tripped up by this each time I install MySQL so I thought I would post this as a reminder to myself with the hopes it may help someone else out too. I have probably setup and installed MySQL on Ubuntu at least 5 or 6 times in the past 2 years. Each time I think wow how easy and each time I get stuck when it comes to remotely accessing the MySQL instance. In my production environment this hasn't hit me because I have MySQL on the same VM as my application and only allow local connections. However, in my development environment I don't want that restriction. So naturally, when faced with an information problem, I use a search engine and try looking for this information. Inevitably I either find the posts that show how to change the configuration of the service OR I find the posts showing how to adjust the user privileges but I never seem to find a combination post. Here's my combo post. When running this utility you will be given an option to allow root "remote" access which I would think you should ONLY do in a secure environment if you know what your doing. Have you heard that before? You probably also heard the speech about setting a good root password, so I'll spare that one for you and just say I would if I were you. Now to make sure that your user connections can actually connect you need to actually grant the users privileges. That looks something like this in my case. This should get you up and running and connecting remotely. File level encryption prevented rendering of image file on IIS 7. I was recently deploying an application to a staging environment. The application had been tested on several development workstations and everything appeared to be fine. This of course is the "typical" developer story and it is why staging environments are so crucial to successful deployments. Once the application was in staging I proceeded to make a few cursory checks of the new things that would be tested by the people doing QA. That's when I noticed that the new buttons on a page were not rendering. As it turns out, the images for the buttons were actually set for file level encryption. Once I turned off the encryption the buttons were rendered in the view. So if you have magically missing buttons on your web pages under IIS 7 have a look at the attributes for the file. Another clue to the issue came when I looked at the folder containing the images files. The two buttons that were not rendering both were listed (I use the details list quite often) in green color font which made them stand out in the list against the rest being black. If you need to remove file level encryption all you have to do (assuming you have permissions to modify the file) is right click on the file then choose properties. When the dialog is displayed clicked the Advance button and then un-check the option "Compress contents to save disk space". I recently purchased a new Dell T410 Server so that I can run VMWare Server 2.0 and get a handle on the configuration nightmare that is my virtual machine configurations. So far I am loving the new server and VMWare Server 2.0. 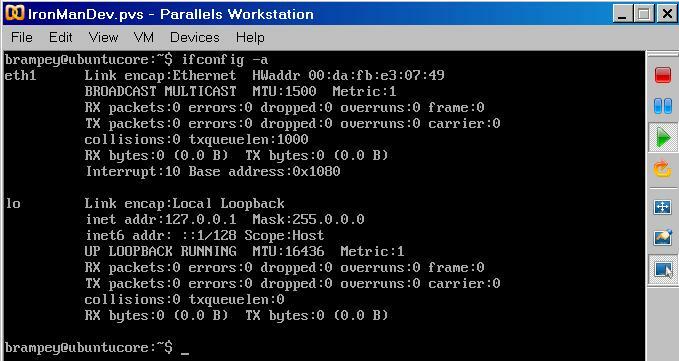 I have been using Microsoft Virtual Server and Parallels Workstation 2.2 to manage all the VM's where I do a majority of my consulting work. Using VM's allows me to partition my work effectively. Unfortunately, it's killing my laptop and desktop to keep managing these things this way. Enter stage left, my new Server. So as usual, I decided to setup some "template" VM's to make it easier to get started on new things. Unfortunately, I made my Windows 2008 Server VM with the default VMWare Server hard disk size of 16GB which I almost immediately had to change. That's when I ran into a bit of an issue. In fact, it was my issue and not VMWare Server. When you increase the size of your disk(s) on a VMWare virtual machine it works like magic. You can do this from inside the VMWare Server Infrastructure Web Access web interface as long as your virtual machine is powered off. Simply select your virtual machine from the inventory list on the left and then click on the tiny drop down arrow on the disk in the center view. This will produce a small menu of choices one of which is Edit. Note: You will see your capacity and if (and only if) your virtual machine is powered off, you will be able to change the disk capacity. Once you change the size it is reflected in the web interface immediately. I thought to myself at the time "that was easy". When I powered up the virtual instance and checked the size of the disk it still reflected the old size of 16GB. Then I thought, I wonder what's wrong? I am not entirely sure why I thought that the OS would recognize the newly available un-partitioned space. Naturally, it doesn't. You basically have to go into your disk management software and tell it to use the space. On Windows 2008 you can go into Settings --> Control Panel --> Administrative Tools and then choose "Share and Storage Management". Once you're there you can select the "Volumes" tab and then select your drive from the list. At this point you have one of two options. You can Extend your existing drive or you can Provision Storage. I choose to extend my existing C: drive. I hope this helps someone avoid a few minutes of confusion. I found a very cool utility this week that has saved me some precious time. I'm working on a SharePoint 2007 project running on Windows 2003 Server and I needed to adjust a feature of the application to send some confirmation emails. My first inclination was to setup an SMTP server for testing. As usual, I started with a search on Google and fortunately for me I accidentally stumbled across Papercut as an alternative to doing my email testing. No need to setup an SMTP server. No need to constantly jump into my email and check for the confirmation. For those times when you do need to see the email in an email client (when you need to check HTML rendering) you can forward captured emails. I've been working in Internet Explorer land lately. This is primarily due to contract work on a SharePoint project where the client really only cares about IE working well. (at least for now) So for all of you Firefox users out there who (like me) are use to have Firebug at your finger tips it can be a little mind numbing to be without a way to see the HTTP traffic in all it's glory. That's where Fiddler comes in to play! In fact, it might just replace Firebug altogether for me. I like the stand alone process approach. So far Fiddler is footing the bill. If you're looking for a good Web debugging Proxy that is free then you should give it a try. I was working on a project today and ran across a painful delay. I have Windows 2003 Server with Microsoft SharePoint 2007, SQL Server 2005, and IIS 6.0. I was finally to the point (actually long past it) where I should have setup SSL for some testing. Naturally I hit the search engines to find the easiest way to setup a self signed certificate under IIS. That is when I ran across this post on SelfSSL which is part of the IIS 6.0 Resource Kit Tools. Unfortunately, that's where my trouble began. I followed the instructions installing just SelfSSL and the log analyzer tool. Then I proceeded to use the SelfSSL to create certificates for my SharePoint site(s). Installing the certificates using the tool was painless. No errors, it just went smoothly. I have form based authentication and I was able to connect via SSL but something weird was happening with AD site and it was preventing me from actually working. Since I couldn't afford to be delayed on some of this work I decided to revert the system back to non-SSL state and keep working figuring that I would get back to this when I had more time to spare on solving whatever issue was keeping things from truly working. That's when all the fun began. I removed the certificates using IIS manager and then restarted the server thinking I'll get a clean start to ensure it would be working again. I was indeed wrong. When the system came back up I wasn't able to connect to the SQL Server instance. I received a slightly different (and much longer) message from try to connect using SQL Server Management Studio. Here's the important parts. "error occurred during the pre-login handshake ... No process is on the other end of pipe"
Naturally I was confused as to why uninstalling SSL certificates would affect my SQL Server connection but it did. As it turns out, SQL Server uses a certificate to encrypt the login information even if your not going to use a secure connection. In the absences of an assigned certificate SQL server will create a self signed server certificate to use. Unfortunately, if there are certificates available then SQL Server will "apparently" grab a certificate to use providing it meets certain criteria which apparently my discarded SelfSSL certificates did. After reading numerous posts to understand what was happening I was able to clean it up on my system. See below for some of the more useful posts I found on this topic. What must I do to fix this? Make sure you have the same problem. Apparently there are a few ways to get these same error messages from SQL Server so unless you have recently installed or un-installed self signed certificates on IIS where IIS is on the same box as SQL Server 2005 you might find this fix won't do anything for you. 1. Click the Windows Start button and ran MMC to get the Microsoft Management Console. 2. Choose File --> Add / Remove Snap-in... from the main menu. 3. Click the "Add" button on the Standalone tab. 4. Choose "Certificates" and click the Add button. 5. Choose "Computer account" and click the Next button. 6. Choose "Local computer" radio button and clicked Finish. 7. Click the "Close" and "OK" buttons on the previous two dialogs. 8. In the list I navigated to "Certificates (local computer) -> Personal -> Certificates"
NOTE: Your self signed certificates might be some place else but they're most likely here. CAUTION: Be sure you SELECT the right certificates in the next step!!! 9. Click on certificates to select them and use the option to delete. BE SURE TO get the self signed ones. There could be others here!!! After I did this my SQL Server 2005 instance was all good again. I was able to connect. Hopefully find this post helpful and it save you some of the 2 hours I lost on this little expedition. Recently I needed to setup what I think are common gems, for many Ruby on Rails, users on the Ubuntu 9.10 VM I use for development. I thought I'd document these in one place since I had to go to several places to find the information I needed. I just recently set up a development environment for Rails on Ubuntu 9.10 so that I could move towards using Apache and Passenger which would more closely resemble my production environment. After installing Ubuntu on a VM under Parallels Workstation 2.2 build 2222 I decided to clone that VM before configuring Apache and Passenger to match my production environment. That's when I ran into a little snag. After creating the clone of the fresh Ubuntu install I noticed that I didn't have a network connection. Unfortunately everything seemed fine until I tried to install the Rails gem and it complained. This displayed the error "SIOCSIFADDR: No such device" referencing eth0. (This of course means no network connection which in turns makes it bit more challenging to install the gems needed for my Rails applications.) In any event, I was able to locate several posts (see a couple references below) that ultimately lead me to a solution. 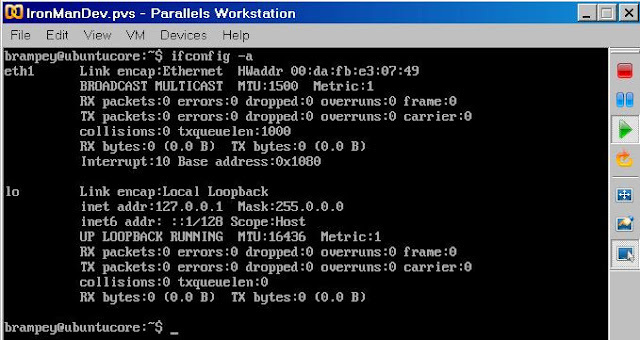 It turns out that the clone has a new MAC address (as it should) and Ubuntu (or at least some part of it) was keeping track of what MAC address belongs to each interface. When I first had this problem I tried running "ifconfig" to see what was going on. The only thing showing was the loopback connection. One of the posts I read suggested running "ifconfig -a" which actually shows all interfaces (up or down) and this tipped me towards the real problem. NOTE: I'll be using the -a forever now. No point in seeing just half the picture. These posts also suggested that a file located in the folder /etc/udev/rules.d contains the persistence rules for the network interface. In my case that file was a file named "70-persistent-net.rules". I removed that file, restarted the VM, and the problem was solved! That file was re-created with the correct MAC address for eth0. I suppose you could manually edit the file to contain the correct MAC address for eth0 and remove the eth1 entry but I didn't try it since the file is automatically created. The future direction of programming languages? The keynote is about trends in the future direction of programming languages. 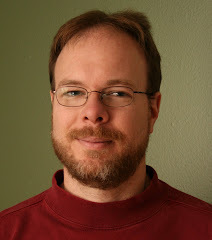 His overview of imperative, declarative and functional programming is very good and he also dives into Static vs. Dynamic programming languages and spins a future where these two approaches are melted together. All in all I found the entire session worth watching. Enjoy! I consider myself still fairly new to Rails after about a year of learning and I still seem to get caught up on some things that I shouldn't. I'm working on an application that needs to care about money to some extent and I was hoping to avoid the pain of dealing with floating point issues. I've been there numerous times in the past and it is never enjoyable and sometimes results in embarrassing situations as you try to explain why somethings don't add up correctly or compare well. These experiences have me leaning towards storing money as integer values in the database and working with them as pennies. So I was happy to see someone has already done most of the work in Ruby and there is a nice plug-in for Rails to simplify the code in the model. If you're dealing with money in your Rails application the first thing you'll need is the Money gem and then you'll likely want the act_as_money plug-in. It seems that most things in the Ruby and Rails communities these days have forked all over God's green earth and it is often a challenge trying to figure out what I should use. (Am I the only one seeing and thinking this?) I dug for an hour or so and read through numerous posts before making my decision. Because I'm using Ruby 1.8.7 and Rails 2.3.5, I decided to go with the original Money gem (currently 2.1.5 updated November 2009) instead of the collectiveidea Money gem. For those of you with Rails 2.1 or earlier you might want to consider using the collectiveidea-money gem as it appears from my reading that you'll have more success there. It's that or bite the bullet and move to a more recent version of Rails. I also opted to use the act_as_money plug-in from collectiveidea (updated 11-19-2008). Again, for anyone on Rails 2.1 you will want to pull that plug-in from the repository using the 2.1 tag. First install the Money gem. The next thing you'll want to do is create a migration if your existing models with non-integer money values. In my case I was using decimal instead of integer. Here are a couple methods I used in my migration to covert the data in the columns being changed. After creating your migrations you'll want to adjust your models. The plug-in will make this easy to do. In fact, it's easier than most of the posts show if you named your column with a suffix of "_in_cents" as shown in the previous step. The "_in_cents" is the default assumed by the plug-in when using the composed_of method for creating the Money object. The Money gem has core extensions for Number and String which adds the to_money() method. Once I decided to make the switch I was able to make changes related 22 fields and 14 models in about 1 hour. All my model tests confirmed things were working correctly. Hopefully you found this helpful. Good luck! Ever had just a couple of minutes you wanted to burn and look at something new? I did today and was hoping to have a quick look at Spree. It's a Ruby on Rails e-commerce solution for developers to use in building e-commerce applications. I ran across it last year and quickly passed it by as not having enough of what I needed at the time. I'm back full circle looking at Spree again for an upcoming project and I decided it's come far enough that I'd look under the hood. That's when my couple of minutes ran out quickly. I'd like to say it's because I was doing something wrong or in someway caused the issue myself. I'd like to say it's because I looked at Spree and just couldn't put it down because I liked it so much. Unfortunately neither is true. I'm running Rails 2.3.5 under Ruby 1.8.7 on Windows XP Pro. Please, no cracks about Windows being my development environment and how that is wrong. I had to wade through enough of those postings from over zealous Linux developers before I found some information I could use to solve the problem before me. I was following the Spree Guide - "Getting Started with Spree" in the hopes I would accelerate my quick look. When I ran the rake db:bootstrap command I received and error. It appears that Spree has a dependency on a gem called jeweler which has a side affect dependency on Git. It just so happens I have Git installed (use it all the time now) but I hadn't created a repository out of the "mystore" project (since I was just looking) so it was failing. My quick way around the error was to just initialize a Git repository for this project. If you don't have Git installed you might as well do that now. It will save you time if you've decided to stay in the Ruby on Rails community. After I got passed the "stack level too deep" I had to install a few more gems and then I hit another error. "undefined method 'av_template_class' for Haml::Util:Module"
I didn't have Haml installed before I installed Spree. It came along as a dependency. Turns out the dependency has an issue. If you hit this error Haml 2.2.16 isn't going to work for you so you'll need to downgrade the gem to 2.2.15.